Enjoy perfect relaxation in a natural wood hot tub in the privacy of your own holiday lodge. Percy and Jules lodges at Brompton Lakes are our luxury cabins with hot tubs and they both have their own private log burning, wooden hot tubs, tastefully designed and made from Siberian larch, the most environmentally friendly construction material and perfect for use all year round. 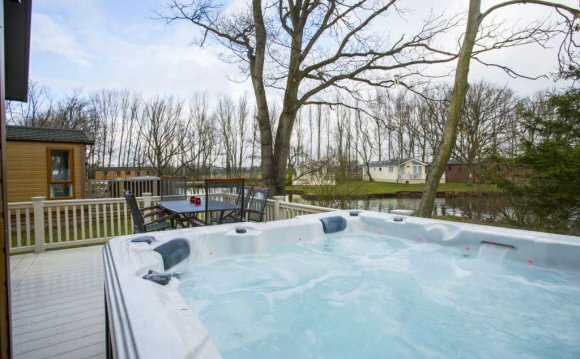 Guests can enjoy unlimited use of the lodges hot tubs during their stay, the cost is based on the number of nights you are staying; just tell us when you book if you want to use them during your stay. They are heated by logs only making them highly sustainable and we don't use any other form of fuel except for the lighting, which is all low-energy. You'll find plenty of kindling and logs available for you to fire up the stove for subsequent uses during your stay. We clean the tub and change the water for all new guests but not each day. The first heating will take up to four hours but the water will stay warm in between uses if the lid is in place and subsequent heat cycles will take less time. Let us know if you want to enjoy the hot tub on the day of your arival and we will get the log burning stove going in time to warm the water up ready for you.